Everyone has a “relationship” with money that determines how much he or she makes. Strengthen that relationship and SHATTER the glass ceiling of your income! Now take the next step, by clicking below and ordering Prosperity Consciousness now. I'll send you the complete 12-session audio program, PLUS Fredric Lehrman's invaluable five-account system with corresponding affirmations. If it doesn't, simply return the program anytime within 30 days for a refund - no questions asked. 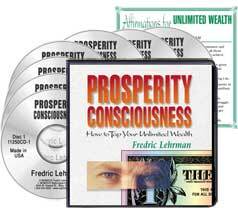 Please send me Fredric Lehrman's 7-CD audio program Prosperity Consciousness at the discounted price of $58.95 which is 75% off the regular price of $234.95. If within 30 days, I have not improved my financial situation, I will simply send it back for a full refund. No questions asked.